I love banana nut muffins. They are probably my second favorite muffin, behind the ultimate in muffin-ness, the blueberry muffin. 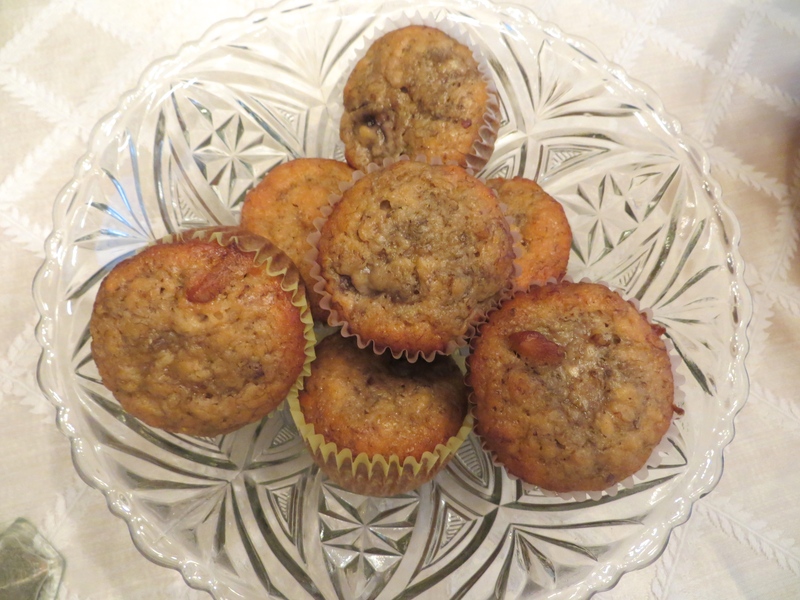 But since I can get amazing fresh bananas all year round, banana nut muffins are my go-to favorite breakfast treat to make. Bananas + walnuts + whiskey + baked in a muffin shape = breakfast nirvana. I took Tyler Florence’s Ultimate Banana Nut Muffin recipe and made some changes. The flour mixture is basically the same – flour, baking soda, and salt. But I added a little cinnamon and nutmeg. Their inherent spiciness gives the muffins a wonderful depth and hint of warmth. Then grab some semi-overripe bananas. I would show you the picture of the bananas in their skin to show you that the bananas should be yellow with many, many brown spots, but not over brown-black and mushy. Mushy bananas have no texture. Almost over-ripe bananas have amazing texture. Please, for the awesomeness that are your banana nut muffins, please use almost ripe bananas. The one component that I didn’t change is the butter. One and a half sticks of it… this recipe makes a lot of muffins. To make the muffins, grab your stand mixer and affix the whisk attachment. Toss in two almost overripe bananas. Try to keep your sister, who happens to think that almost overripe bananas are the best way to eat bananas, from eating them. Beat those two things together until they are completely combined. Then slowly add in two eggs. Now here is where I depart from Tyler’s recipe. I not only add vanilla, but a little whiskey too! Bananas and whiskey are a classic combination and the addition gives the muffins a little somethin’ somethin’. After all the liquid ingredients are thoroughly combined, slowly add the dry ingredients into the mixture with the mixer on the lowest setting. Or else you will have flour all over yourself, your kitchen, your cat, etc. Grab yourself some walnuts (Tyler used pecans…). And dump them into the batter along with the mashed bananas. Stir to combine. Now comes the fun part – baking the muffins! Grab your favorite scooper or measuring cup and dish out the batter into muffin tins lined with muffin liners. Bake them at 375 degrees for 18 minutes or until they are golden brown! These muffins are a delightful addition to any breakfast, brunch, or late night snack! Enjoy! 2. In a medium-sized bowl, combine flour, baking soda, salt, cinnamon, and nutmeg. 3. In a small bowl, mash two bananas with a fork until they are broken down but still have texture. 4. In the bowl of a stand mixer, toss in the other two bananas and the brown sugar. Mix until they are well combined. 5. Add in the eggs, melted butter, vanilla, and whiskey. Mix thoroughly. 6. Slowly add in the flour mixture – mix until the flour disappears and stop. 7. Fold in the mashed bananas and chopped walnuts. 8. Scoop batter into lined muffin tins. Bake for 18-22 minutes, or until the muffins are golden brown. 9. Serve warm or at room temperature! Koukla Koukla Koukla Catherine! : This is another superb recipe with beautifully styled photos!. I also enjoy your creative improvement of the recipe by adding the whisky and spices.